COME EXPERIENCE LIFE IN THE SKYE where you are steps from the beach. VACATION IN THE SKYE features mesmerizing views of Okanagan Lake, a swimming pool, 2 hot tubs, BBQ area, gym, billiards room, putting green and group lounge area. This elegant 2 bedroom unit and Den set up as a third bedroom has high end furnishings and linens and is well equipped to pamper up to 8 guests. At Vacation at the Skye you can park the car and enjoy resort living with a quick stroll to all of the hot spots in Kelowna including great restaurants, night clubs, casino, boardwalks, and family friendly activities. Vacation in the Skye is suitable for girls getaways, family groups, couples travelling together or business travelers who want to meet and rest in 5 Star luxurious surroundings. Contact us if you are travelling with your dog as depending on size we may be able to accommodate your furry friend. We have parking for 2 vehicles in our secure underground parking. There is a rental agreement for this property that must be completed prior to stay. We live in Lloydminster Alberta but spend time in Kelowna and area as often as we can. We love all that downtown Kelowna has to offer and that we can ride our bikes on bike paths most places we need to go. We also love to spend time on our boat the "Sea Rider" (we are Saskatchewan Roughrider fans). We have 5 sons and 2 grandchildren and that keeps us busy. Vacation in the Skye is in Waterscapes Resort. This resort has all the amenities of a luxury hotel and is in the heart of Downtown Kelowna so we can park the car and everything is within walking or biking distance. The view from Vacation in the Skye is stunning and when we are there it is truly a luxury hotel experience with all the comforts of home. Travelers will fall in love with the view and being able to walk across to the bird sanctuary or Tugboat Beach and stroll along the boardwalk to enjoy the view , go for dinner or enjoy any of the great amenities downtown Kelowna has to offer. Across from the condo take a stroll along the boardwalk which follows the waters edge all the way to downtown and City Park. Waterscapes Resort offers amenities including the Cascade billiards room . exercise room . hot tubs . lounge and pool . mini golf of which are located within steps of your suite for your enjoyment. Located at the heart of the city, Waterfront Park has unbeatable views of Lake Okanagan, sandy beaches, beautifully landscaped gardens, washroom facilities, paddle boat rentals and boat launch. From the condo you have a wonderful view of Knox mountain. 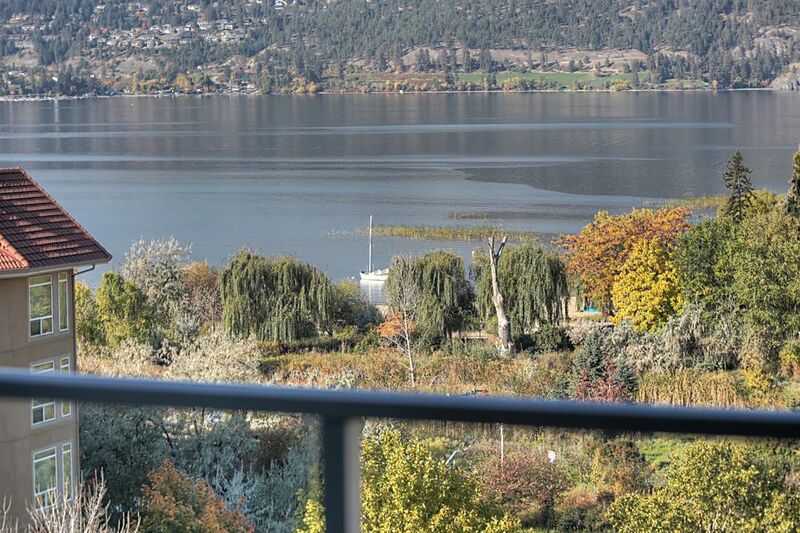 Vacation in the Skye has an amazing view of Lake Okanagan and the Rotary Marshes located at the north end of the beach. From this location you can get on the boardwalk and enjoy the waterfront. Spectacular view - great host. We had a lovely stay. The beds were super comfortable and the living space perfect for family visiting. And the view is even better than pictured with floor to ceiling windows to take it all in. We were especially charmed by the deer running in the green belt below. Highly recommend. Great for families or groups - access to downtown area is ideal. We stayed as a group of 7 people, 2 to each bedroom and one on the living room futon. It was very comfortable, and the hosts were more than welcoming and accommodating of our needs for parking and general accessibility. I would rent this again/recommend to friends and family down the road. Fantastic view as well! Condo had a beautiful lake view and was very comfortable! We enjoyed the hot tub and pool amenities. It was also within walking distance to downtown which we loved! Thank you Wendy for the wonderful stay! I am so glad you enjoyed your stay at Vacation in the Skye. The location is great and we love hearing that friends and families had a great stay and a place to relax and reconnect. We hope you and yours can come again and if you do contact me directly as I love to be able to give returning guests a discount. Four adults and two kids stayed here for over a week and it was an idyllic location for a summer getaway. We had to stay inside a little more than we would have liked due to the forest fires so I am grateful we chose this particular property. It is a fantastic space, with incredibly comfortable sleeping arrangements, and practical common spaces. Dealing with the owner was easy. The amenities and security at the facility were both top notch. Loved having a wagon provided to bring our gear down to the beach. Even though we were here for the peak of summer, it never felt busy. My only complaints would be that we weren't able to check in at the pre arranged time as cleaning was taking longer than expected, and I would have loved the knives to be sharp as we cooked from home for most of our meals. Absolutely would return here. Kelowna has activities for any palate but is world renowned for its wineries and opportunity for wine tours. To save guests tax we send a separate payment request for the $175 cleaning fee, parking fee of $10/day for 2 UNDERGROUND SECURE SPOTS ,$75/stay pet fee if applicable , 5% GST on these items and credit card fee of 3% and . If these fees are included in original invoice they must be taxed at 16% so your savings is huge. Guests are subject to Strata bylaws such as no smoking/vaping or open labelled alcohol in common areas or on decks, and noise restriction in common areas and in suite after 10 pm. Violation will result in a strata fine. Smoking in the rental will result in payment of all costs to re mediate smoke smell or damage. Please do not instant book if you have large groups of unrelated people or a pet. Please contact owner first.